I hate applesauce. Mushed apples and water? Blech. I like my apples crisp with a nice crunch when I bite into them. So when I noticed the apples in my fridge (yes, I keep apples in the fridge) were going soft, I knew I had to do something with them. And since I had over-ripe bananas in the freezer, I figured this was the perfect time to make applesauce to use in a low fat banana muffin recipe (coming soon!) I had bookmarked earlier in the week. I scoured the Internet for applesauce recipes and with the help of Rachel over at Coconut & Lime (she’s so patient! ), I got to work. I was pleasantly surprised to learn applesauce is extremely easy to make (and not so surprised to find that I still don’t like it). I didn’t add much sugar since I knew I was going to bake with it, but if you’re planning to eat it and are using tart apples, throw it in. Also, I divided it into small individual Glad containers which I froze to use in future recipes. In a saucepan over medium heat, combine apples, water, sugar, and cinnamon. Cover and cook for 20-30 minutes, or until the apples are soft enough to mash. Mash with a fork (or pulse in a food processor like I did). Even if you don’t like applesauce, I think it’s a genius idea to use your overripe apples to make sauce for your baked goods. Genius! I may just have to try this sometime. 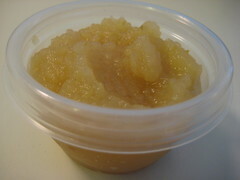 I have a really nice recipe for Gingered Applesauce, which would be probably a great ingredient to add to cookies. I’ll have to try that next time I make some (I usually just eat it). Were the apples peeled, cored and/or chopped or just tossed into the saucepan whole? Dena, sorry about that. I peeled, cored, and sliced mine. From what I read online, you don’t need to peel, but you will end up with a lumpier applesauce that way. I’ll fix the recipe in a bit, thanks! Btw, I heard about refrigerating apples on Good Eats. I do it all the time now! @howtoeatacupcake – what did he say about keeping them in the fridge?